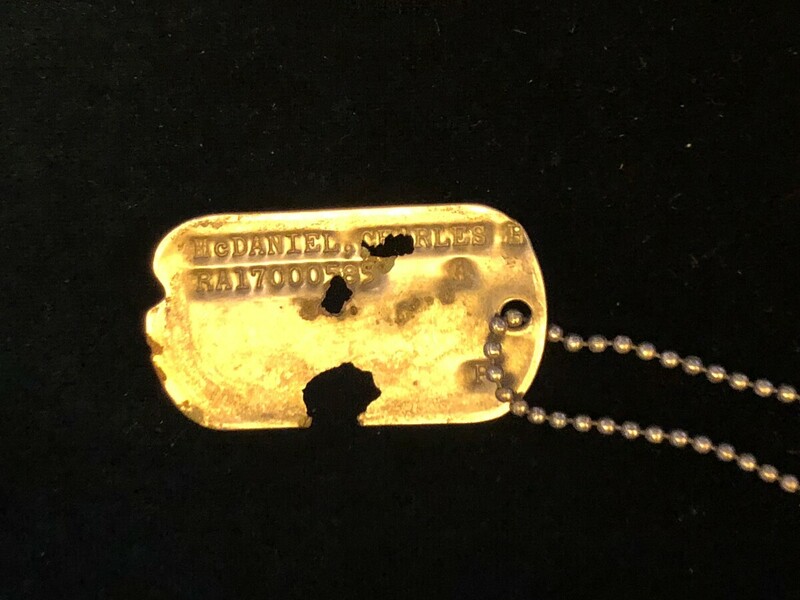 Sons Get 'Certitude' After Receiving Their Missing Father's Korean War Dog Tag After decades of ambiguity, "We have certitude," Charles McDaniel Jr., said on Wednesday, adding that he and his brother are "the most fortunate because we're the only ones that have a name now." The single dog tag in the 55 boxes of human remains turned over to the U.S. by North Korea last week was still readable. It was presented to Master Sgt. Charles Hobert McDaniel's two sons at a ceremony on Wednesday. It's difficult to know exactly what happened to Master Sgt. Charles Hobert McDaniel after U.S. Army forces were attacked by small groups of Chinese communist soldiers during the early days of the Korean War in November 1950. But on Wednesday McDaniel's sons — both toddlers when he disappeared — got something they've been missing for 68 years: "certitude." Charles McDaniel, Jr., and his younger brother Larry McDaniel were presented with their father's ID tag by the Defense POW/MIA Accounting Agency at a ceremony in Arlington, Va.
After decades of ambiguity, "We have certitude," the elder McDaniel, a former Army chaplain, told reporters. "We are, in one small sense, the most fortunate because we're the only ones that have a name now," he added pointing to the small metal name plate. What the brothers knew before Wednesday was gleaned from the records of the DPAA: Their father was with the 3rd Battalion in the southern end of the Nammyon River valley during the surprise attack but he was "not among the survivors who escaped through the Chinese perimeter." The agency concluded that "no evidence exists that he was ever captured or held prisoner by the enemy." Absent verification all signs suggested McDaniel had been killed as U.S. and U.N. forces attempted to stave off thousands of Chinese troops driving them out of North Korea. Additionally, a medic who was also assigned to the 3rd Battalion told officials "he believed that McDaniel was killed in action within the 3rd Battalion's perimeter," according to the DPAA. The Defense POW/MIA Accounting Agency estimates more than 7,800 Americans remain unaccounted-for from the Korean War. The dog tag, as they're commonly known, was the only ID tag in the 55 boxes of human remains turned over to the U.S. by North Korea on July 27. The remains are "undergoing forensic analysis" at a lab in Hawaii but at Wednesday's press conference the head of the Pentagon's DNA lab, Dr. Timothy MacMahon, rubbed two swabs inside Larry McDaniel's mouth, as Jay Price from member station WUNC reported. "Officials said samples from McDaniel's sons could be crucial for figuring out whether the bones in the box with the dog tag actually belonged to their father," Price reported. The military is seeking to build up its DNA database but still needs samples from nearly 1 in 10 of the families of the missing, according to Price. Neither Charles McDaniel nor Larry McDaniel have meaningful memories of their father, they admitted to reporters. Charles McDaniel said he was about 3 years old and Larry McDaniel was 2, when their father was initially deployed to Korea in August in 1950. When pressed, Charles McDaniel described small flashes of detail rather than moments. "He liked ice cream and watched his weight," he said. "He's an Army guy ... I'm an Army guy, so I understand that," he added, drawing a connection between himself and the man he never got to know. Larry McDaniel has "generated" more of a feeling about his father. "To me this is a big-picture thing," he explained. "I'm proud that my father was extremely patriotic and loved the country enough that he was able to dedicate his entire life for the country without hesitation. But the thing is he was one of thousands of guys in that generation that did it. And I don't think the fact that we found his dog tags should overshadow any of that."